Maintain add rating with a higher target price (TP) of RM2.60. We maintain our “add” recommendation on Eco World Development Group Bhd as it remains one of our top picks in the sector. However, our TP has been raised after adjusting for our Revalued Net Asset Valuation (RNAV) for the appreciation of selected landbank. We have lowered our target basis of a 10% discount to RNAV from 20% in view of the near completion of the restructuring exercise. Potential re-rating catalysts include strong new sales and continuous landbanking. Eco World shares went ex for a 1-for-2 rights issue (at RM1.20 per share) with 4 warrants-for-5 rights shares (seven years to expiration and exercise price of RM2.08) yesterday. The 657 million rights issue will increase the paid-up capital of Eco World to 1.97 billion shares. The exercise comes on the heels of a 1-into-2 share split in Januay and the acquisition of landbank from Eco World Sdn Bhd (EWSB) for RM3.8 billion in February. The next milestone is a proposed 20% share placement targeted for completion in the second quarter of 2015 (2QCY15). We view positively its rights issue with free warrants as it will raise RM788 million and help reduce the group’s gearing to around RM1.2 billion. The Feb 6 completion of the acquisition of EWSB’s landbank also consolidated all the Malaysian landbank of the Eco World group under one umbrella and confirmed Eco World’s status as the flagship development arm of Tan Sri Liew Kee Sin and family. Upon completion of the 20% private placement, likely in 2QCY15, the paid-up capital of Eco World will increase to 2.36 billion shares and help improve the liquidity of the stock as well as lower its gearing further. 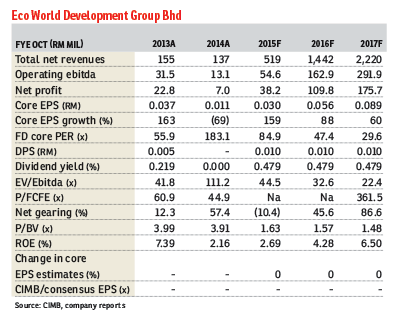 Despite the decent year-to-date share price performance, investors should continue accumulating Eco World as the group was one of the few developers that bucked the softening sales trend in 2014. We believe it has a good chance of repeating that outperformance this year. Also, Eco World’s share price will continue to be driven by landbanking efforts with the Feb 4 completion of the Pudu Jail joint venture adding further impetus.